Luce rolled her eyes but pulled out her sword anyway. "Alright, Erin. Us versus you. Although with that blade your likely to win." She went to stand beside Chris. "Remember how I taught you," she whispered to him. Chris nodded, and re-enacted how to snap her sword off. He doubted he would be able to, but he would try, or semi try. He sighed his eyes narrowing. Erin smiled as Chris made his first mistake. She thought Luce would correct hi, but she didn't. Erin let it go, but he was trying to copy twin half sword stance with a regular half blade. She knew that it was wise to let the opponent strike first, but she humored him. she lunged to the side and spun her sword, kind of tossing them in the air as she slid off to the side. That move was one she had been practicing for fun. "I forgot to mention, the only reason I intruded on the lesson was Chiron's orders. We all best train for what's coming Luce." she said, only Luce would understand, she shouldn't have told Chris a thing yet. It was classified. Chris watched with interest as she landed on their other side. Replaying the action in his head, he nodded. He looked at the sword and smiled. He nodded his head slowly and moved around the arena, thinking about it. He twiddled his sword and stood ready, this time leaning differently, as the first time had felt strange. He looked at Erin a strange glint in his eye. Erin smiled, a natural learner, could be Ares or Athena, maybe even Hermes. She didn't know his background. But she lunged and rolled like a ninja across the ground, she landed behind him and had her swords pointed strait forward. Waiting to see if he would parry. Chris watched her move, never taking his eyes off of her. She landed behind him and he turned, quickly deflecting her sword. He took one step back unsure of what to do next as this was his first spar, yet he held his sword in front of him unsure of her next move he wanted to be ready. Erin went and took her other sword, sliding the blunt of the blade (The side with no sharpness) and prying his leg up, freeing her other sword with a wrist flick, she side stepped and pulled up, this tripped every opponent other then one. An Athena girl she'd faced a while back. Chris should have panicked but instantly he side stepped, landing on both feet evenly balanced. He smiled thrust quickly at her, flicking his wrist. In an attempt to make her drop her sword. Luce stepped back, content watching them. She could pick up a few skills, and studied them intently. Erin was doing very well, and she didnt have high hopes for Chris. Although he was holding up on his own. An owl appeared above Chris's head as he deflected the move. She froze. As head councilor to the Athena cabin, she should consider herself happy that there was another Athena child in camp. However, he was completely new and he managed to ESCAPE her death trap move. "Welcome to Cabin of Athena Chris." She said as the owl flew away. Luces eyes lit up as Chris was claimed, but felt a twing of dissapointemnt. "Congats Chris," she said, putting on a happy face. 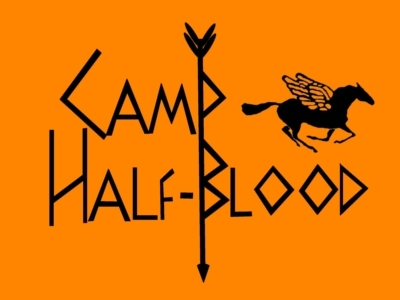 "Welcome fully to Camp Half Blood." Chris was proud of himself, when an owl flew above him, in plain daylight. He looked at it confused. "Welcome to Cabin of Athena Chris." "What?" He looked at Erin and Luce utterly confused, it showed in the depths of his blue-gray eyes. "That owl, Athena just claimed you." She said, smiling now. She had a new prisoner camper to her cabin. This was nice, but he had a lot to learn to be worthy to be considered a child of Athena. "You have just been claimed by Athena. Looks like she was proud of your fighting skills." She smiled, her grin wide. It fell a bit, but rose again with force. "Now you and Erin are Cabinmates." Chris was still a bit dumbfounded. When he had learned about Greek gods and goddesses in school, Athena had been one of his least favorite goddesses and now she was his mother. He tried to smile, but wasn't exactly sure of his feelings. One he was a bit intimidated by Erin and second he had forgotten all about wanting to find out about his mother in the spar. "Oh, um that's cool I guess." He stepped back a bit and turned around putting the sword back. Feeling kixed inside of him. Erin grinned. "I have to go do some stuff for Chiron, Luce, can you take it from here?" she asked, sheathing her twin swords, she never kepted them in the armory, they were a gift from her mother. She kept them on her at all times. Chris rubbed his head with his fingers as he thought about it. Should he be happy, super happy, mad? He was so confused at the moment, that he was starting to get a bit dizzy. He sighed and tried to keep his thoughts straight. For now he had to focus on the thought that he had been claimed something he had longed for. He sighed and put the sword back as well as the shield. He turned to Luce a strange new , not happy or mad light in his eyes. His fists were lenched yet his body looked relaxed. Luce rolled her eyes. "Sure. Have fun." She gave a small wave and turned to Chris. "So, how does it feel to be claimed by Athena?" Chris saw the roll, he chuckled slightly. He shrugged, "I'm not really sure how to feel. She never was my favorite in class, so umm awkward maybe?" He gave a lsight smile, as if to say, "What's done is done." "I guess were both not happy with our mothers." She shrugged, tilting her blade so it caught the sun. "I guess we cn talk some more as we go, but I want to show you something." She pushed her sword into her belt headed through some bushes. Chris followed her silently. He didn't dislike his mother, it was more of indifferent shock. He sighed and made sure everything wa in place before completley stepping out..